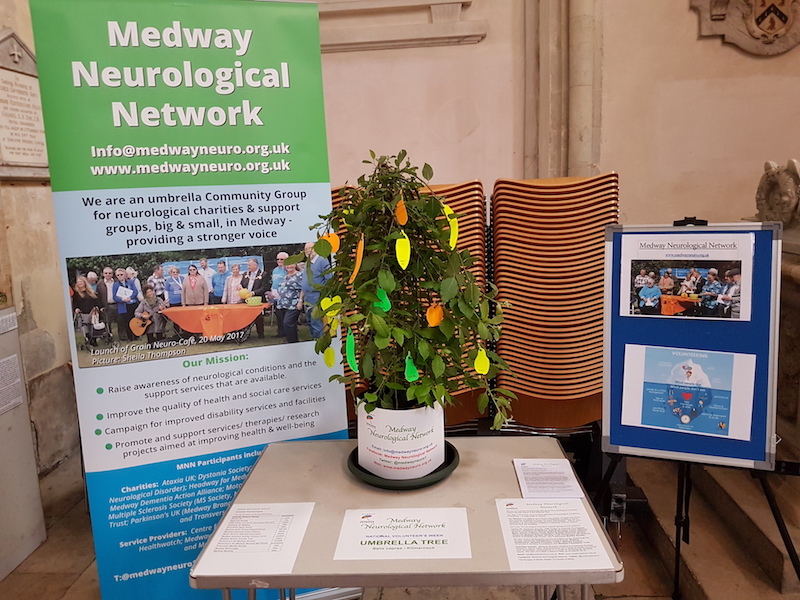 Medway Neurological Network was fortunate to be given a stall in the very busy Atrium, right next to the Mr Sawbones operating game!! Ian, Jane & Martin were able to help and signpost a good number of people who had neurological concerns. Congratulations to Medway Hospital on organising a great event, celebrating 70 years of the NHS; where would we be without them? Deputy Mayor of Medway, Cllr. 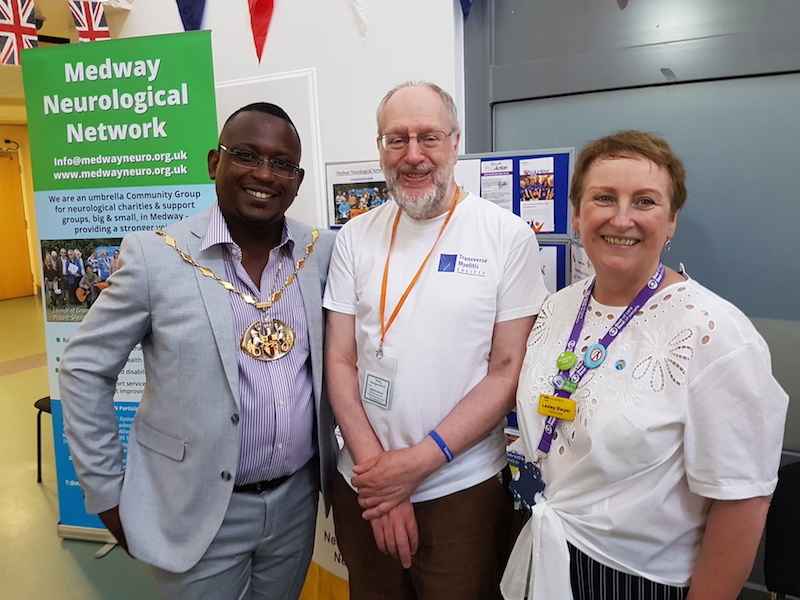 Habib Tejan, showed an interest in our stall, and offered to drop in on one of our Medway Skylarks sessions. Medway Hospital CEO, Lesley Dwyer, was passing by so Martin grabbed a photo opportunity, as shown to the left. Cllr. Wendy Purdy, who is a strong supporter of MNN, not only dropped by, but helped on the stall!! We were also very pleased to see another of our long-time supporters, Cllr. Vince Maple, pay us a visit. It should be added that everybody that visited our stall was also a VIP. Thanks are due to Ian Prior, Jane Etheridge and son Will, and Martin Nagler for setting the stall and manning it throughout the day. 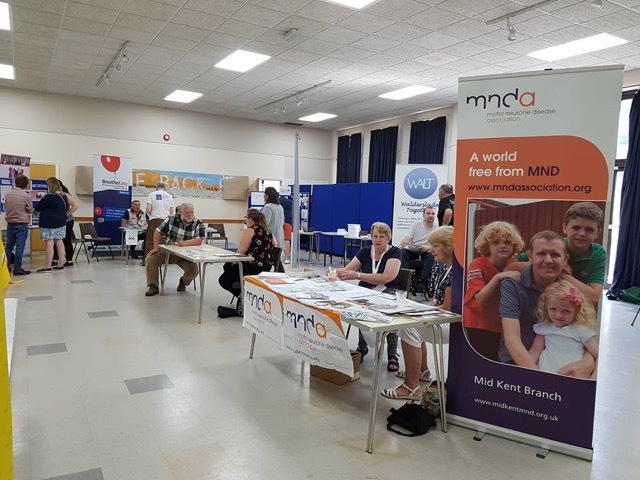 Many thanks to organiser, Joe Wastell, for inviting Medway Neurological Network, and its participants, to have a stall at this valuable awareness event. Pictured is the Motor Neurone Disease Association stall, manned by Sheila Thompson. Disability Medway Network is doing a great job raising awareness of support for those with disabilities in Medway. This fayre, sponsored by Involving Medway, will be going on tour and another three events are planned throughout Medway. 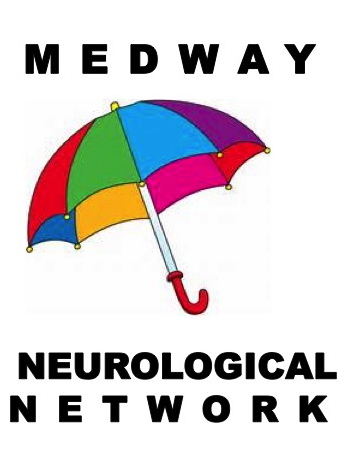 The Neurological Charities have a national awareness week or day each year and these can be promoted on this website; particularly to highlight any Medway events. Parkinson's UK: Awareness week 9-13 April with Parkinson's World Awareness Day on 11 April. Please see details below. Sainsbury's, Hempstead Valley Shopping Centre at 4pm. Dystonia Society: 5 - 8 May, click HERE for details of National events. Transverse Myelitis Society: 9 June, click HERE for information about events. Medway event to be announced. 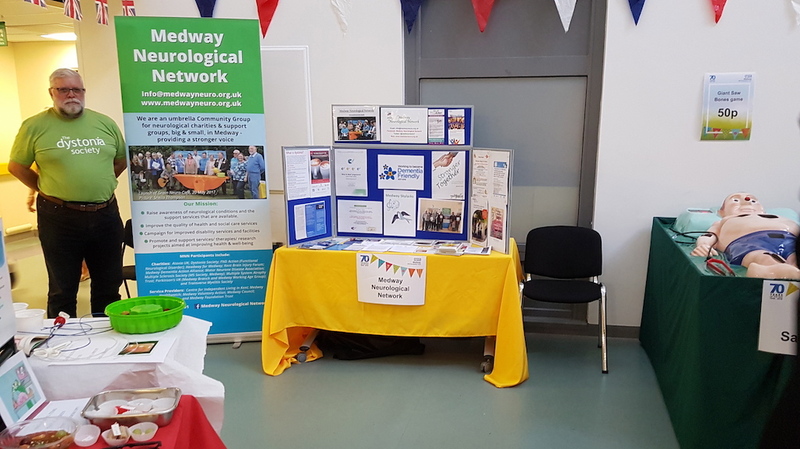 This event, organised by the Voluntary and Community Services (VCS) Leaders Network, was Medway's contribution to the National Volunteers Week, for more information, please click HERE. The theme was 'Fruits of Volunteering' and organisations were invited to exhibit a TREE that illustrated their volunteering work. MNN exhibited the tree shown to the left with each of the charities and support groups in the Network represented by a fruit on the tree. Individual stories of volunteering, and its rewards, are invited to either be placed on the tree, or displayed beneath it. Many thanks to Cllr. Wendy Purdy, Watling Ward, for sponsoring the tree. This major event was held in Rochester Cathedral. It was opened by Tracey Crouch MP, Minister for Sport & Loneliness, and had a full programme of talks and an awareness marketplace. 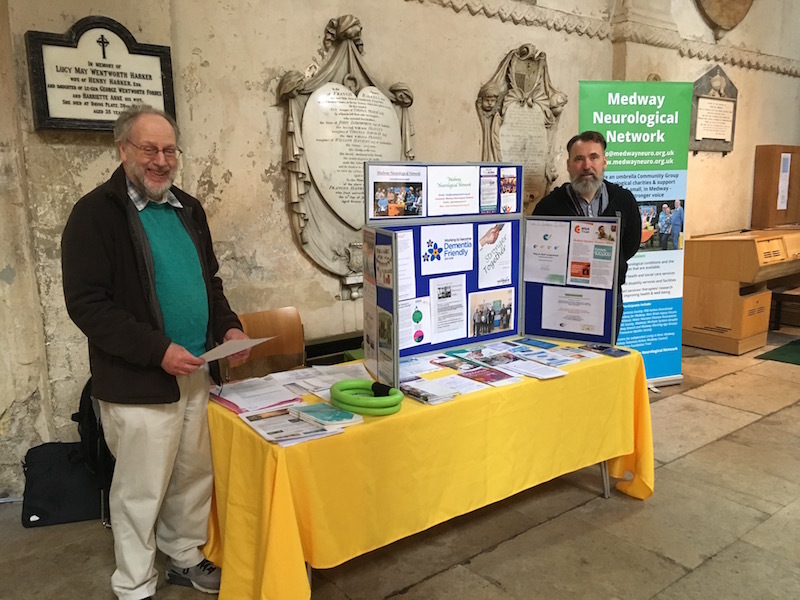 Medway Neurological Network joined 16 other stall-holders at the marketplace and we can report a lot of interest in our work. Loneliness was a recurring theme and our MNN Neuro-cafes, and indeed our Medway Skylarks, can all help reduce loneliness. 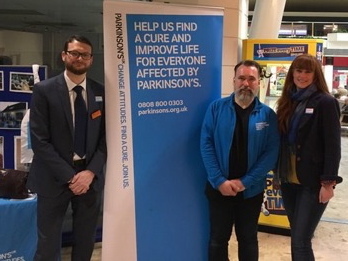 Parkinson's UK Medway Working Age Group Coordinator Phil Bungay with Rochester and Strood MP Kelly Tolhurst, who kindly supported this event. 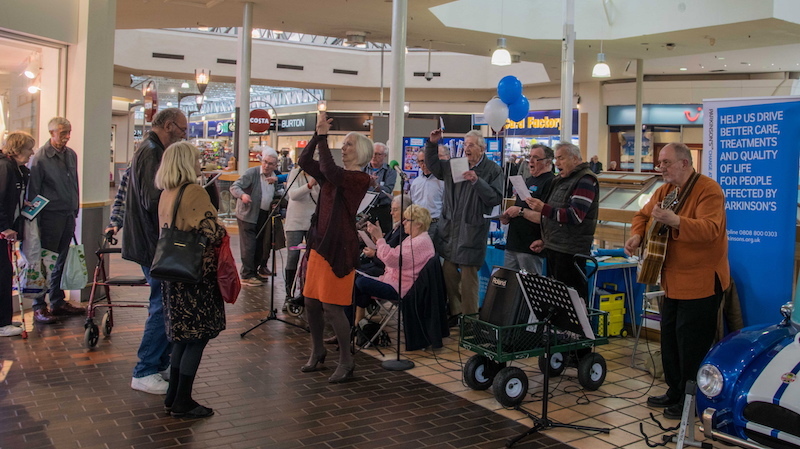 Medway Skylarks performed at the stall to help raise awareness of Parkinson's Disease/ World Parkinson's Day. Trish Vella-Burrows led the choir and John Cornwall accompanied on the guitar. See also landing picture at the top of the page. Please use the Activities/ Skylarks tabs to see more photos.